Clate Mask is the co-founder and CEO of Infusionsoft, the leading provider of Email Marketing 2.0 software for small businesses. Clate loves to help small businesses grow. His passion for entrepreneurship is infectious and obvious from the moment he begins speaking. His dream is to revolutionize small business growth through smart automation. Scott Martineau is the cofounder and VP of Product Management at Infusionsoft. Scott is a serial entrepreneur who can't imagine ever working a "regular job." He is a technologist at heart, driven by his vision: to create an easier way for entrepreneurs to run their small businesses. Section I The Quest for Freedom. Why Entrepreneurs Choose Not to Grow. Scenario #1: You Don’t Want to Grow Your Business. Scenario #2: You’re Relying on Referrals and Repeat Business. Scenario #3: You Believe You’ll Just Figure It Out. Scenario #4: You Do Everything Yourself—Manually. 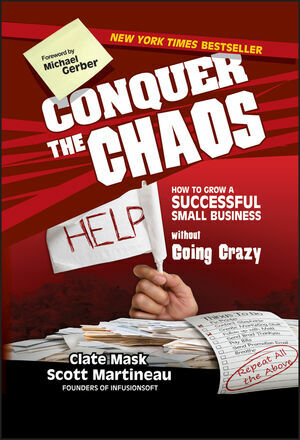 Introducing—The Strategies for Conquering Chaos. Section II Mindset Strategies: Achieving Balance. Your Emotional Capital Bank Account. Making Deposits in Your Emotional Bank Account. The Three Components of Disciplined Optimism. Opportunities to Practice Disciplined Optimism. Practical Ways to Cultivate Disciplined Optimism. Facing the Challenge of Independence. Section III Systems Strategies: Controlling Speed. The Struggle of Disjointed Systems. The Value of the Right System. The Most Neglected Marketing Principle. How Lack of Follow-Up Is Creating Chaos. The Science Behind Effective Follow-Up. What You Can and Should Automate. Section IV Find Your Freedom. The Myth of Long, Hard Work. The Belief Your Business Will Fail without You. Climbing the Hierarchy of Freedom.